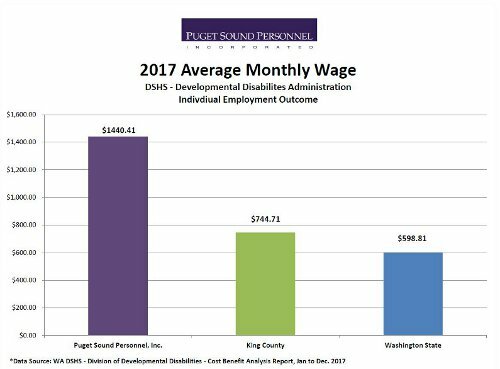 Puget Sound Personnel's (PSP's) individual employment outcomes and wage statistics for the people they serve with developmental disabilities. 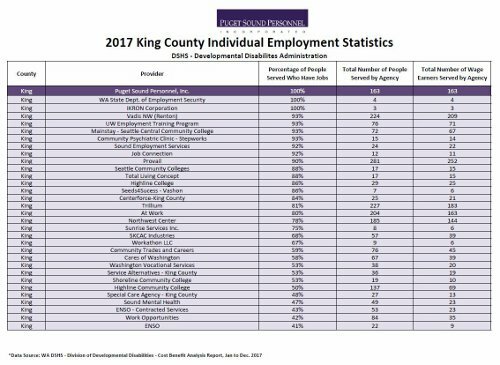 The King County Developmental Disabilities Division and the Washington State DSHS Developmental Disabilities Administration compile performance statistics on individual employment agencies in our region and throughout the state. 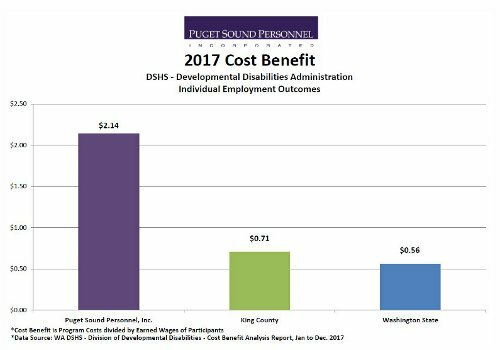 The following charts and graphs utilize that data to compare PSP's employment outcomes in 2017 against other supported employment agencies in King County and throughout the state. This chart lists King County service providers according to the percentage of their participants who have jobs in the community. This information provides a measurement of an agency's employment program outcomes. To evaluate a vendor's success in job placement efficiency and training effectiveness, be sure to compare the size of the population they serve to the number of people earning wages. Of the 163 people PSP served in 2017, 100% were employed and earning wages. In 2017, many of the people with developmental disabilities using PSP as their supported employment vendor took home bigger paychecks—earning an average of $283 more per month than in 2016. For the year, those we provide employment services for earned an average of $1440.41 per month in gross wages. This is 93% higher than the average monthly wage of other supported employees working in King County. These figures reflect our mission of developing career-oriented work opportunities and inclusion in the community. This chart shows the average number of hours PSP participants work in paid jobs per month compared to the average hours worked by people using other vendors in King County and throughout the state of Washington. PSP's outcomes are considerably higher. We believe this reflects the caliber of our job training and support services that keep those we serve gainfully employed. Equally important to our success in this area is the long-term partnerships we build with employers to develop new job opportunities for people with disabilities. 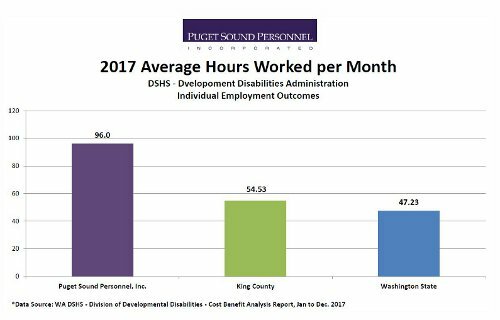 The goal of King County's Developmental Disabilities Division is to have supported employees work an average of 20 hours per week in paid employment. Given PSP's outcomes, we exceed that with our participants working an average of 22.3 hours a week in paid jobs compared to the 12.6 average work hours of people using other vendors in King County. Statewide, supported employees average 10.9 work hours per week in paid employment. Using taxpayers' funds wisely is a benchmark of a successful human services program. A cost benefit analysis of program costs divided by earned wages shows that PSP has been a good steward of these dollars with a $2.14 return on investment for every $1 spent in program costs. In King County, the average return on each dollar spent on program costs is $0.71. The return statewide is less with a cost benefit average of $0.56 for every $1 expended on supported employment costs. Another way to assess the quality and effectiveness of our services is to consider the positive impact they have on the economy of our area. 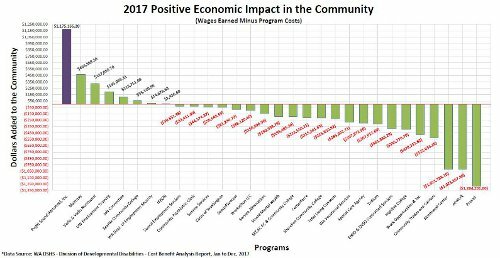 This chart looks at the participant wages added to the community minus the cost/overhead of administering a given program. PSP has an appreciable lead over all the other vendors analyzed, responsible for adding close to $1.2 million of earned wages to our local economy. For individuals and parents seeking to evaluate supported employment agencies, as well as employers looking to partner with successful programs―this data offers an objective analysis of employment outcomes and costs for 2017. You have a choice in determining your employment services provider. We hope that you will consider PSP. Review this website. Check out what the people we serve say about PSP. Call us to discuss your employment goals. Puget Sound Personnel, Inc. (PSP) helps people with developmental disabilities and other disabilities in King, Snohomish and Pierce Counties find career-oriented employment in community companies. Based in Bellevue, Washington and serving the Seattle area and greater Eastside, PSP provides customized employment services including supported employment, school to work transition and vocational rehabilitation.